We like our denim here in Texas, so hopefully that gives me some credibility on how to style a whole outfit full of denim. But, no matter where you are, fall is a great time to break out the denim, so I want to share some tips to style denim on denim. Now, this can be tricky because you don’t want to look overwhelmingly blue. Denim is naturally a very casual look, so these outfits are great for lazy fall weekends. I’ve found some really cute denim pieces and I want to show you some tricks to make denim on denim work for you. If you prefer to watch, then I have done a video styling and modeling these same outfits. This denim on denim video is a collaboration with my friend Anna from Mutton Style. She does amazing look books, hauls and vacation videos in Europe. If you want to check out her video, click here. In all these outfits, I have one piece in common and that is my dark wash jeans. I love the Kut from the Kloth brand, and I got these at Nordstrom. They are soft and stretchy and so comfortable. I always to pick pieces that aren’t too trendy. Hopefully you have something similar already in your closet, so that you can easily replicate these looks. I will provide links on the items, and if I can’t find the exact item, I will find something similar. This first outfit is about as classic as you can get with denim on denim. I took a very soft, flowy white tee shirt from Old Navy and paired it with those dark wash jeans from Kut from the Kloth. I found this light chambray jean shirt at Target and it is nice and loose, so it fits well over anything. A shirt like this could also be tied in a knot in the front if you didn’t want to let it hang loose like this. I paired it with some gold layered necklaces and black laser cut booties. To show another variation on this, I added a colorful scarf. I think adding a color in the center of all the denim is a great way to break up the blue on blue. My next outfit also uses that bright pop of color in the center to break up the blue. Even though I have 2 dark denim pieces here, the bright green shirt and leopard print belt break up the outfit enough so that you barely notice I’m mostly covered in denim. 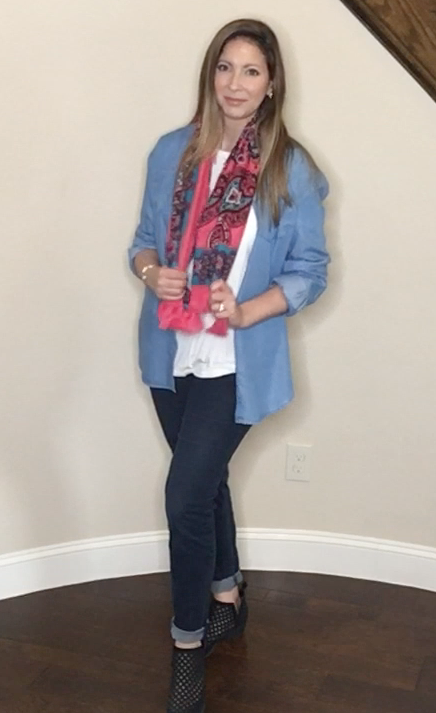 The shoes are a black wedge heel from Nine West and they are really comfortable, but just rolling the jean at the bottom to show off the shoe also is a great way to break up the denim by drawing your eye all the way down through the outfit. This shirt from Nine West is denim, but it has stripes in it to add a little interest to the whole denim look. I have seen other denim pieces with light white polka dots or patterns printed on them and these are a great way to get away with wearing all denim, but having a subtle design element to break up the look. I used gold booties and a gold statement necklace to dress up the look a bit. You could also try adding brightly colored shoes or a bold colored necklace as a way to break up that denim. Outfit number 4 is just straight dark denim, with a denim shirt from Target and those same Kut from the Kloth jeans. But what I did here was added pops of color by using a red scarf at my neck and then red shoes, so even though it’s not breaking the blue up in middle - it is adding that bright red to the mix, so that the outfit doesn’t look so stark and blue. So there were my 4 denim on denim outfit ideas. Please leave a comment with your tips on wearing denim on denim – I want to build a happy helpful community here on Artsy Cupcake, so I would love to hear from you. Thanks so much for reading and I hope you have a happy day!